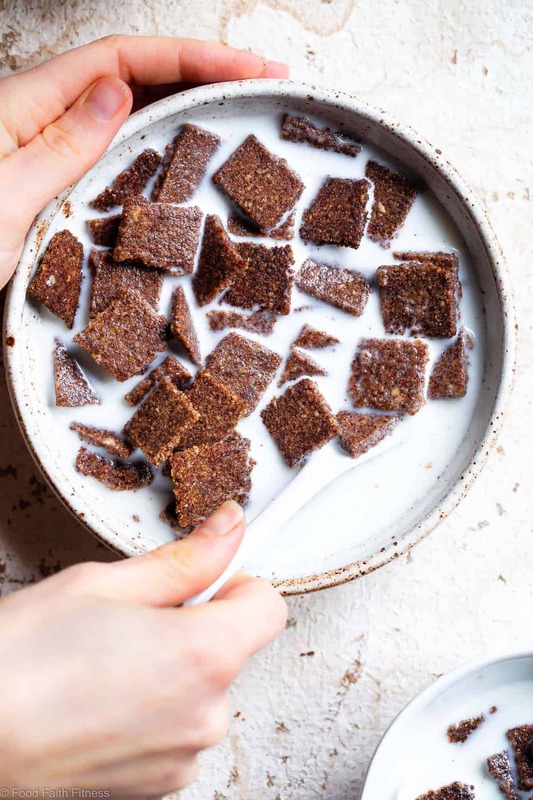 This easy Homemade Keto Low Carb Cereal tastes like cinnamon toast crunch but its gluten/grain/dairy/sugar free and healthy! Only 6 ingredients too! Do you eat cereal with milk OR without it, straight from the BOX? My answer is 100% STRAIGHT FROM THE BOX. Do not like the soggy breakfast experience that happens when milk snuggles on up to the crispy squares. HOWEVER, this sugar free cereal? I can actually eat it WITH MILK because it stays SO FREAKING CRUNCHY. For real. I did a crunchy test (the scientific terminology) and let it just sit in a bowl of milk for like 30 MINUTES. When I went back to check, my bowl of low carb breakfast cereal was just hanging out, being it’s spicy-sweet squares of CRUNCHY self. Internet friends. 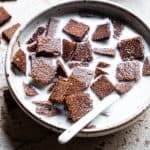 This might be a bold statement, but I think we have just discovered the BEST low carb cereal. What cereal is low in carbs? To my knowledge, there are not a lot of traditional cereals that are low in carbs, as many are grain-based and are packed with sugar. 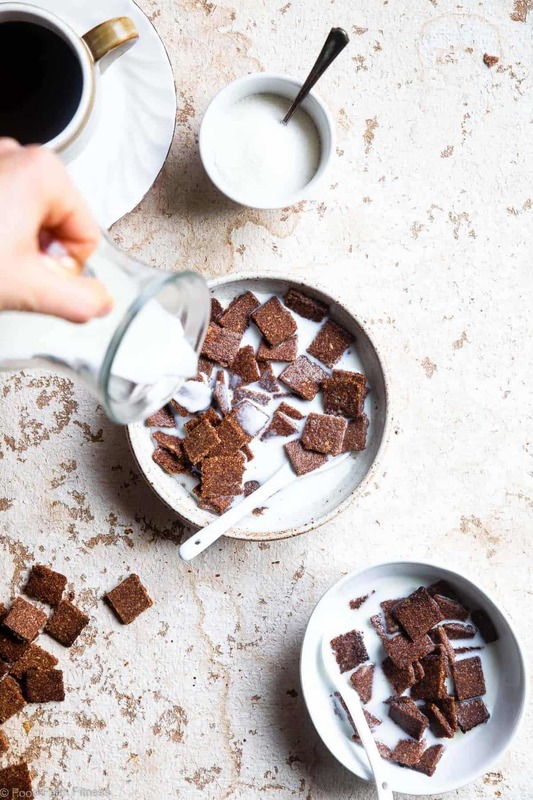 You’d have to opt for some grain free low carb keto granola or sugar free keto low carb granola bars if you wanted a little CRUNCH CRUNCH experience to be all up in your breakfast business. 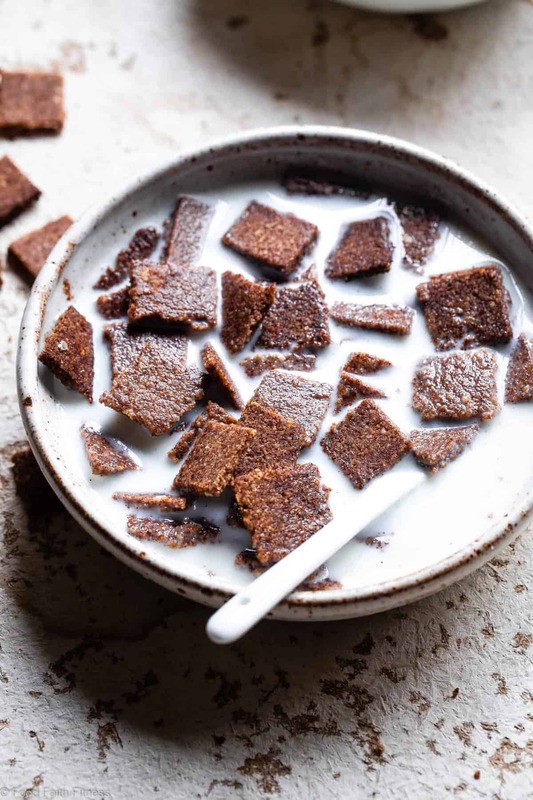 Think of this homemade cereal recipe like my childhood favorite, Cinnamon Toast Crunch, but WITHOUT the grains, gluten or even the SUGAR. It’s like a cereal version of no oats paleo oatmeal! Don’t worry though, spicy-warm-cinnamon flavor still VRY VRY intact. If you’ve ever seen me eat ALMOST anything, you would know that cinnamon is pretty much my love language. It’s honestly kind of disgusting how much of it I can eat. Anyway. You didn’t come here to learn about the inner workings of my gross cinnamon addiction. You came here for HOMEMADE keto low carb cereal tttthhhhaattt you probably thought was going to be eleventy billion ingredients and take approximately 32 hours to make didn’t you? NOPE. 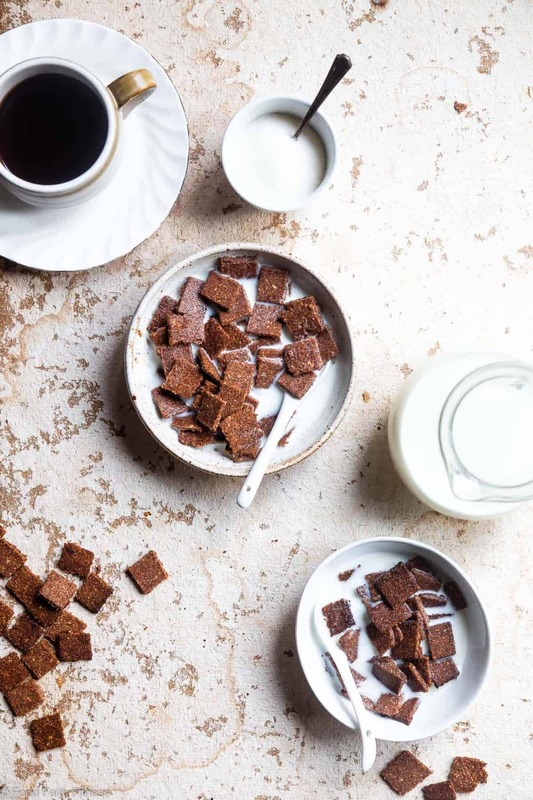 We’re talking 6 simple ingredients and only 45 minutes stand between you and crispy cereal breakfast BLISS. 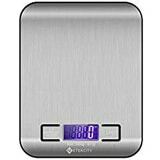 I know I know, you’re reading the directions and you’re annoyed that you have to cut each and every ¾ inch square out and transfer it to a pan because WHO HAS TIME FOR THAT. But I am here to tell you that YOU HAVE TIME FOR IT because the end result is cereal that fancy-person-you made yourself, which is going to make you feel very elite and accomplished because WHO DOES THAT? Oh wait, YOU DO you snazzy little human. 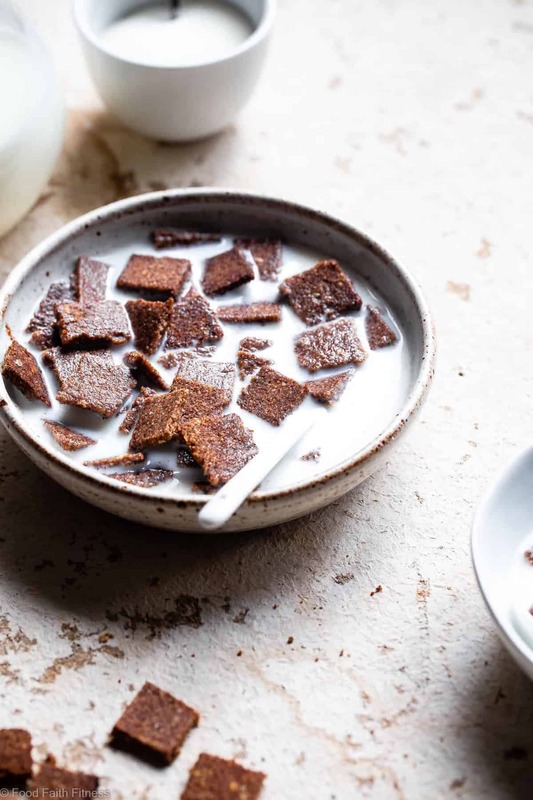 If you’re like me and love cereal from-the-box, these little crispy breakfast gems can also double as a perfectly portable snack for when your hungry mouth gets, well, HUNGRY as you lead your busy-person-on-the-go-life. Can’t you just see yourself whipping out a little baggie of homemade keto low carb cereal at the office and everyone staring at you in awe and jealousy? I normally wouldn’t promote trying to be superior to your peers buttttt when cinnamon toast crunch is on the table…. I think both you and I can agree that we’re TOTALLY OK WID IT. Preheat your oven to 450 degrees and line a baking sheet with parchment paper. Set aside. In a large bowl, stir together the almond flour, coconut flour, 4 1/2 Tbsp of the monkfruit, cinnamon and salt until well mixed. Sprinkle the remaining 2 tsp of monkfruit over the squares and bake until they just turn golden brown, about 5-8 minutes. They burn very quickly so watch them closely. Mine were perfect at 6-7 minutes. They will not be crunchy when they come out of the oven. *As with all GF baking, please weigh your flour to ensure results. ** It's a little tedious to transfer every square to the paper, so I gently slide my knife under about a row of squares at a time, and then flipped them onto the pan and separated them a little bit. I literally need a vegan keto cereal in my LIFE. I know this recipe is NOT vegan, but I would love to try making this with flaxseed meal instead of the egg white! Anyways, I most certainly ADORE cereal and can easily eat it by the handful. Granola is even MORE dangerous because the serving sizes are smaller and the flavor and crunch factor are just addictive! Let me know if you try it with the flaxseed egg Cassie!! Hi, thanks for the recipe! How can I substitute monkfruit sweetener? Coconut sugar, regular cane sugar? Any thougts? I can’t get monkfruit sweetener where I live..
Hi there! I have a recipe using coconut sugar already 🙂 Just search “cereal” in the search bar! You can TRY, but I fear it might not crisp up! The coconut flour absorbs some of the moisture, so I really can’t promise it will work! 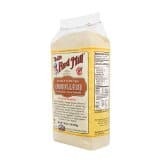 Hey there, do you think flaxseed flour could be an appropriate substitute for almond flour, as it is really expensive in my area? I’m sorry but they are totally different things! Oh okay, do you know another substitute then? Made this a few days ago and my son LOVES it – it actually turned out amazing and is really good. Thanks for another great recipe!! Ahhh YAY! I am SO happy to hear this! Is there substitute for the monk fruit sweetener? Like Stevia or date sugar? Best cinnamon cereal ever, love it! Thank you so much!